It’s almost Christmas and I haven’t blogged FOREVER! It hasn’t been for lack of things to share, but simply lack of time and energy! It’s the end of a long, busy and very good day and while I should be heading for bed, I just felt compelled to take a few minutes to share some photos. First up is a fun CAS card that I created awhile back using Taylor’s Poster Graphic Die set along with the Very Merry Outlines Die set. I had had this card in my head from the time I first saw that alpha die set. I love how it turned out even though it’s so different from my usual style. 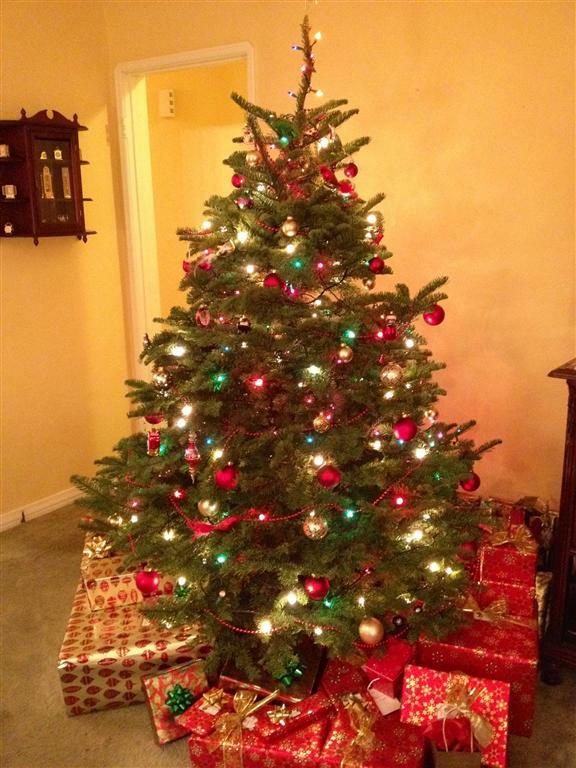 We finished all of our wrapping and got all the gifts under the tree today. 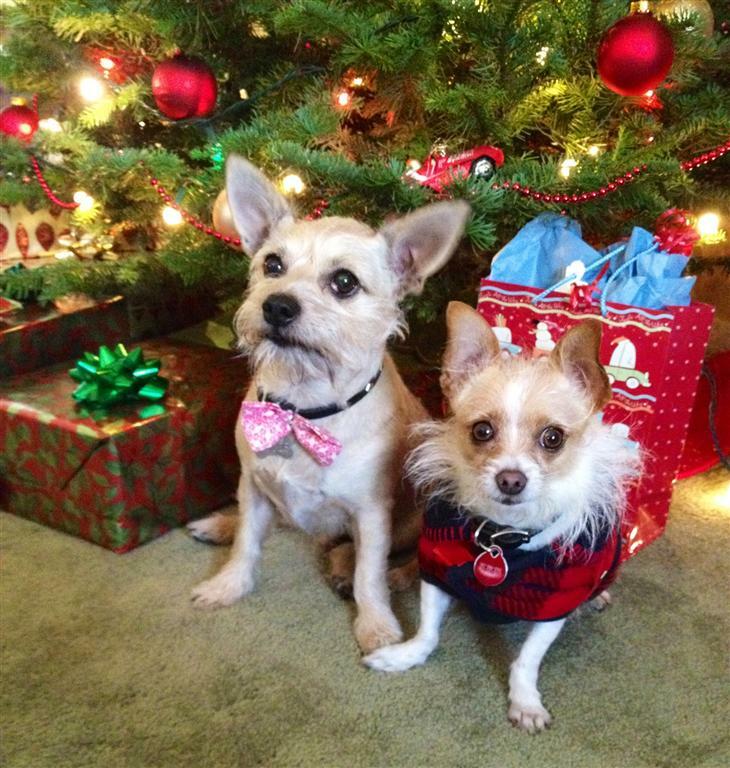 Of course I had to get a pic of the pups with the tree. Tessa had her winter coat on. Roger will sit and stay, while Tessa (the little princess) pretty much does whatever she wants. It took several tries to get this one shot of them. LOL! Today was baking day. 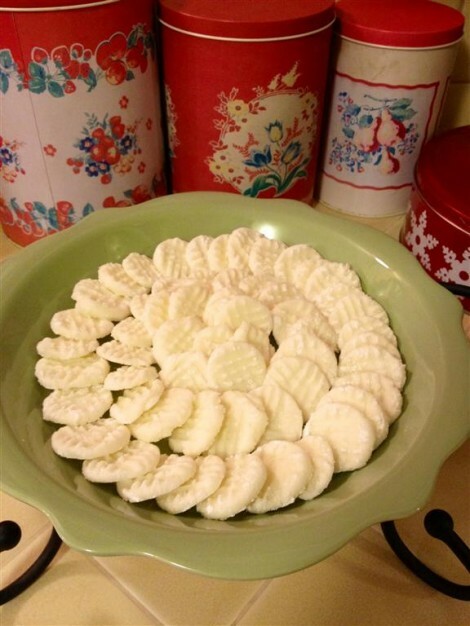 I actually started yesterday with these cream cheese mints. I had pinned the recipe on Pinterest and then kind of forgotten about it until friends started talking about it on Facebook. I decided I just had to try them. They are quite yummy, but I had a heck of a time with them. Apparantly I needed to add more powdered sugar – perhaps it was the humidity – but I had a sticky gooey mess. I understand that they are not supposed to be sticky at all! I just might try them again sometime. I’d really like to dip them in chocolate. Mmmmmm. 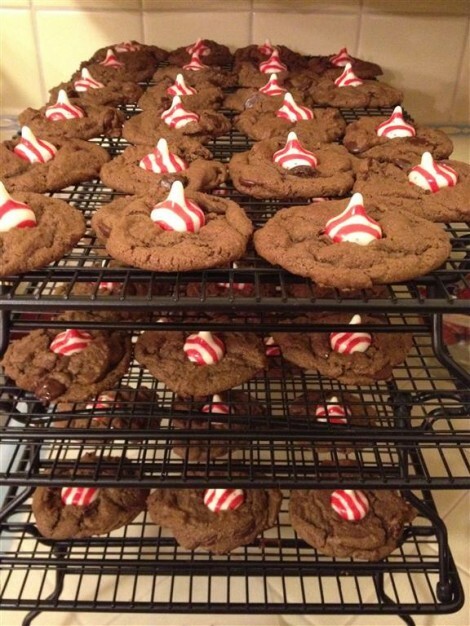 Recipe is certainly easy enough with just three ingredients – cream cheese, powdered sugar, pure peppermint extract. 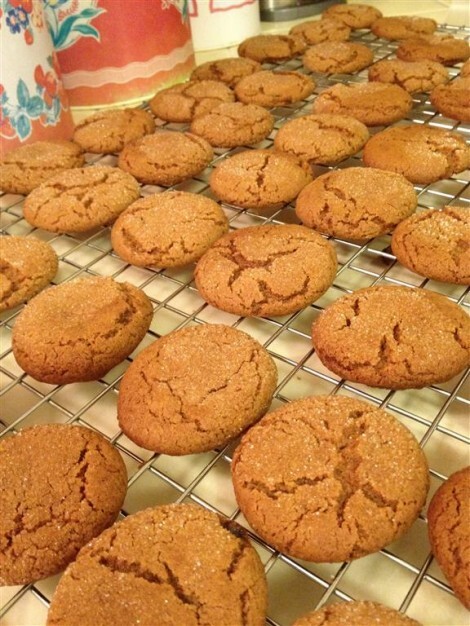 Next on the list were Curt’s favorite – ginger snaps. And then my favorites – Candy Cane Kiss Cookies. The chocolate is so deep and rich. YUM!! In the midst of it all, we took a little break to take the pups out to get them Christmas sweaters! I had hoped for something red or green for Roger, but he looks adorable in the black and gray one we found. 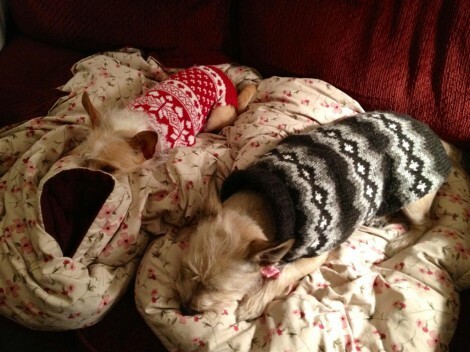 Both dogs seemed to like wearing the sweaters. As you can see, they were totally relaxed. Tomorrow morning, I need to bake a cake for Christmas Eve dessert. My side of the family will be coming over for our traditional lasagna dinner. Yep, it’s almost Christmas and I should be in bed. I hope you are experiencing the joy of the season! Thanks so much for stopping by! Merry Christmas! All of the new products for October were released yesterday at Taylored Expressions. You can find it all in the Fresh Out of the Oven Department. Be sure to check out the Current Specials page also to find out about discounted bundles and kits. We have another day of inspiration for you today as we highlight ALL the new stamps and dies. You’ll want to be sure to hop to each and every blog so you don’t miss a thing! I used the Holly Cutting Plate on shimmery white cardstock and layered it over patterned paper and a cardbase from the Merry & Bright Project Pantry. The holly was embellished with little dots of Thistle Stickles for the berries. 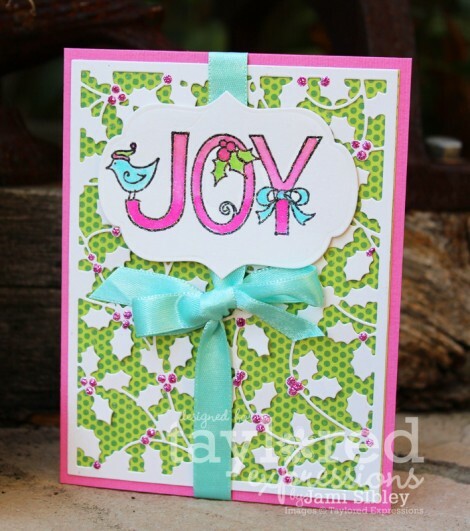 The JOY stamp was heat embossed on shimmery white with black pigment ink and kaleidescope embossing powder and then watercolored. It was die cut with Labels Stacklets 1. I plan to make the majority of our Christmas cards with this die and I’m playing with designs to see just what I want to make over and over again! There are so many possibilities! Thanks so much for stopping by. Happy Friday. I hope you have a wonderful weekend ahead that includes some time to stamp! More projects from the Baker’s Dozen to inspire you. Just follow the link list below. YES! It’s Release Day! 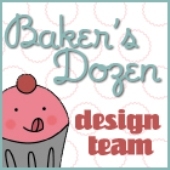 I wasn’t able to play along in the peeks this week, but I do hope you followed along with all the fabulous projects by the Baker’s Dozen! I just had to squeeze in a card for today using the Snowflake Wreath because the idea for this particular wreath is actually what started the whole series! I’m so excited that this one is finally here! I wanted to do something simple and just a little bold with it. Here’s the 4.25″ square card I came up with. I just love the combo of red and aqua, especially when paired with lots of white! The little bird is from the Birds and Branch Taylored Die Set and the little white pearls were created with the Viva Decor Ice White Pearl Pen. I just love how this turned out and it was so easy (no coloring!) that I think I might make a batch of 10 or 12 more. It’s almost time to get those Christmas cards in the mail! Now let’s see what the Baker’s Dozen has cooked up. I know there will be at least one new sample from every set in the new release! Check it out! Enjoy some TE shopping! While you’re there, be sure to pick up a few gifts for your crafty friends as well as the artistic kids in your life. All of these Petite sets and new card kits are perfect little gifts! Can you beleive that it’s December and Christmas is just a little over 3 weeks away. Wow! 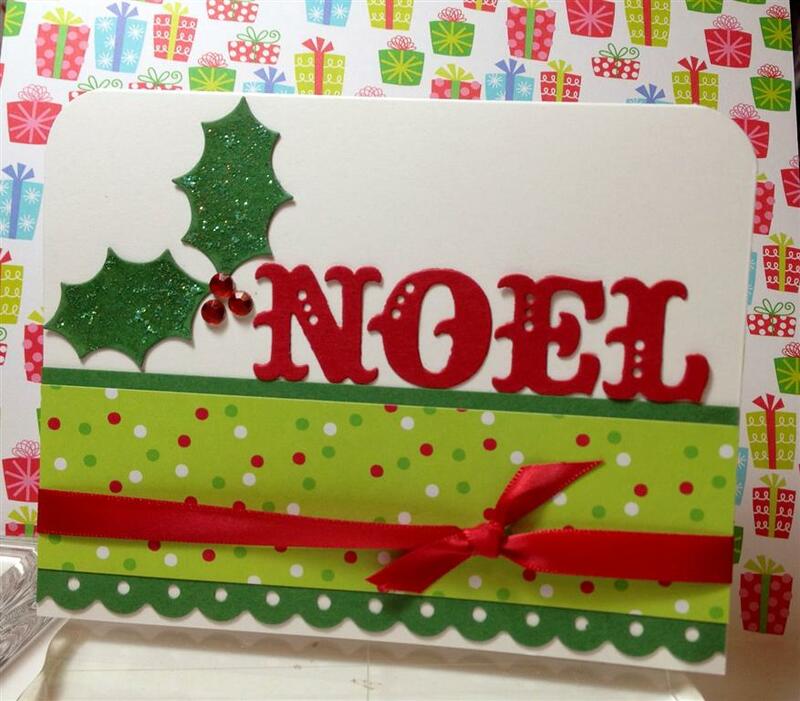 Time to kick the Christmas card making and the shopping into high gear! TE Black Friday Sale and Hop! 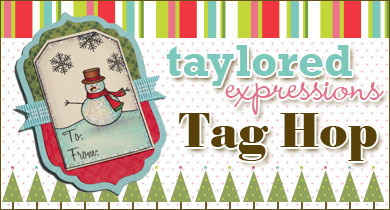 Welcome to the Taylored Expressions Black Friday Tag Hop!!! We’re celebrating the biggest shopping day of the year with a Tag Hop and a HUGE SALE! One lucky customer will win a set of 10 tags (one each of the tags featured in today’s hop.) Everyone who places an order at Taylored Expressions Friday – Monday (11/25 – 11/28) and writes “I want those tags!” in the comments section of the order form will be entered to win. The winner will be announced on Taylor’s blog on Tuesday 11/29. Introducing Tags & Tag-a-longs kits designed so you can quickly and easily create your own tags inspired by today’s samples. Black Friday Sale – enter coupon code BLACKFRIDAY2011 on any order Friday through Monday to save 10-30% off your entire order! HURRY! The earlier you shop, the MORE you SAVE! Details on the TE Store homepage. I hope you had a wonderful Thanksgiving! Taylored Expressions is running an amazing Black Friday Sale and I’m super happy to be participating in a Hop & Swap with some of the Baker’s Dozen. We each created a set of tags, so we can swap. Here’s what I made. 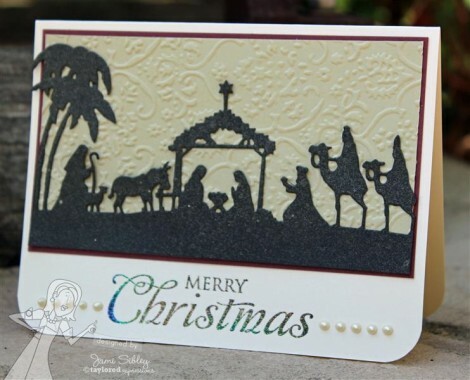 The image was stamped on TE Choice Snow White cardstock and punched with a 1″ circle punch. I used various circle punches and dies to forn the layers and as you can see above I used a brad to attach all of the top layers to the bottom layer. The top swings open to reveal the “to and from”. I used these new Viva Decor pens to dot little “pearls” around the circles as well as to add a nice thick layer of glitter to the little penguin’s hat. These pens are quite easy to use as they have a nice even flow to them. It takes less than an hour for the “pearls” to totally dry. The pearl pens have a really nice pearly finish and the paper pens have more of a glossy look. You’ll definitley want to add a couple of these to your cart when your shopping the TE sale! After you’ve hopped around and seen all the tags in the hop, I bet you’re going to want to create some of your own! 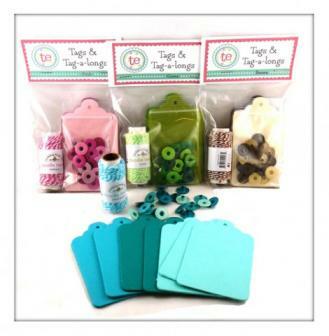 Taylor has put together some great little kits – Tags & Tag-a-longs – to make it super easy! These will be great for Christmas, but you might also want to think ahead to Valentine’s Day (that pink pack is calling my name! 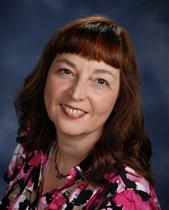 ), Easter, and birthdays. Once you start playing with tags, you’ll be addicted! Of course you can also order the items separately. The Tag Treats Die Cuts come in sets of 10 in your choice of 40 colors. Now let’s check out the rest of the Hop! 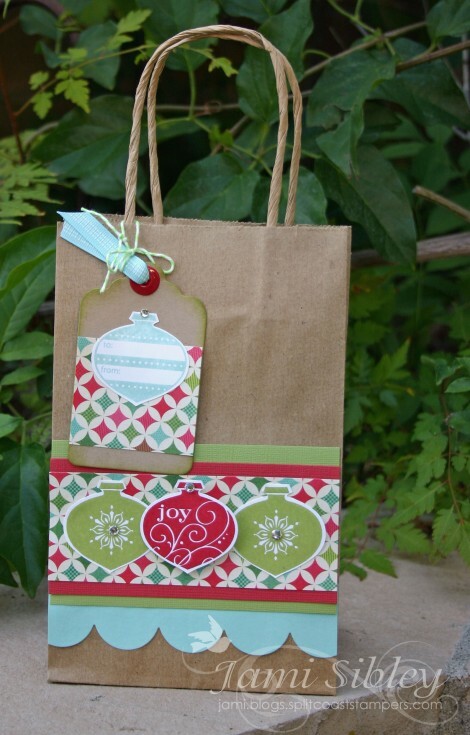 Today I want to show you a quick and simple gift bag and tag that we created in my class last week. You’ll notice that the bag uses just a 2″ strip of patterned paper. This is a great way to use all those scraps you end up with from 6×6 pads when you cut 4″ pieces for cards. We started with a simple kraft gift bag. I purchased a package of a dozen at Joann’s. The papers, cardstocks and ribbon are from the TE 12 Days of Christmas Project Pantry. Since I was using a 6×6 pad, everyone in class got a different patterned paper. It was fun to see how all the different bags turned out. I wish I had taken a photo of them. Since the papers were all from the same collection we could all use the same colored cardstocks and inks. The stamp set is SU Delightful Decorations used with the coordinating punch. Ink colors are Lucky Limeade, Real Red and Pool Party. 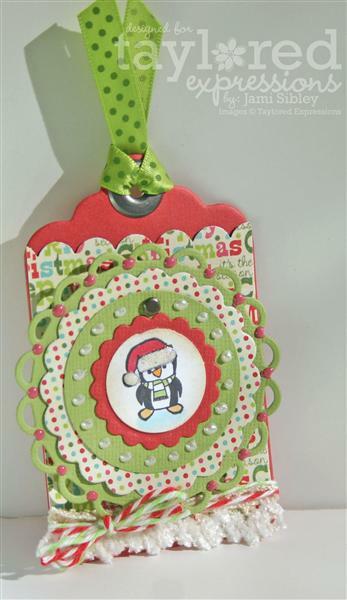 The middle ornament on the back is popped up on double thick (1/8″ as opposef to 1/16″) foam tape. Everyone got a kick out of the HUGE roll I had out on the table. Seriously – it’s the size of a pizza! LOL! The tags are die cuts that can be ordered in sets of 10 from the Favor Box Department at Taylored Expressions. There are tons of colors to choose from. The large eyelets are coming very soon to the TE Store. These bags are so quick and easy to create! It would be great to have some made up and on hand, but they can also be done last minute just using the scraps from the last project left on your stamp table! Just be sure to have some plain gift bags on hand at all times. I like to have kraft and white in two sizes. I’m off to work. I hope you have a fantastic day! Happy Wednesday! 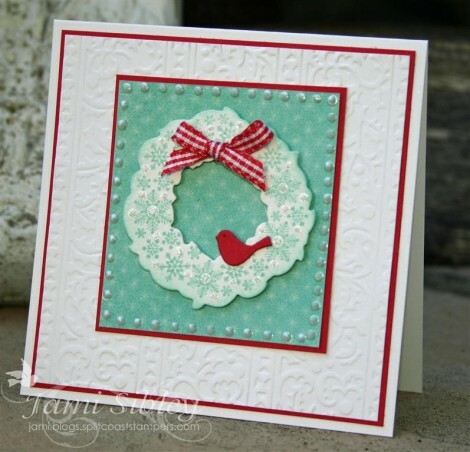 Today I want to share a card I made with the super fun Happy Hoolidays clear stamp set from The Craft’s Meow. I just couldn’t resist those adorable owls and this one all tangled up in the lights is my fave! I colored the scene with Copics and used the Colorless Blender to create some texture on the branch. Each of the little lights was covered with different colors of Stickles and the ornament was covered with Glossy Accents. The patterned paper is MME 12 Days of Christmas and I added some Chocolate Chip cardstock to ground and separate layers. Finishing touches include some white pom pom trim, Doodlebug Bakers Twine in Bon Bon, Viva Decor Light Carmine Red Paper pen (similar to Liquid Pearls), a glittery jingle bell and some faux stitching. I just gotta say – this card really makes me smile. I hope you like it too! Thanks for stopping by! Happy Tuesday! I’m just popping in quick, before I head off to work, to share another card I created with the Trim the Tree Taylored Die and Echo Park Season’s Greetings 6×6 pad. I used the base die to cut a white tree and the layering dies on several different patterns from the paper pad. The edges of the layers are slightlly curled up and I added Dazzling Diamonds glitter to the white edges as sparkly snow. 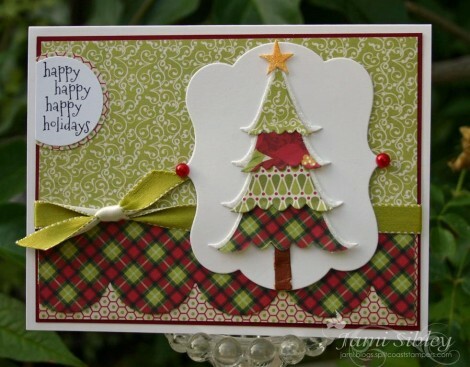 The tree was mounted onto a die cut from the Take Note 3 Taylored Die. The sentiment is from TE Woodland Winter. The plaid paper was cut with the Large Scallop Border Taylored Die. The layout for this card came from TESC147. I honestly just can’t get enough of this tree die, so don’t be surprised if you see more cards with it coming from me. Thanks for stopping by. I hope you have a great week!